Our focus here is typically American built or sold cars, but nearly eighty percent of new Morgan cars are being sold to U.S. customers. Therefore we are including these Morgan car brochures and literature on this site. 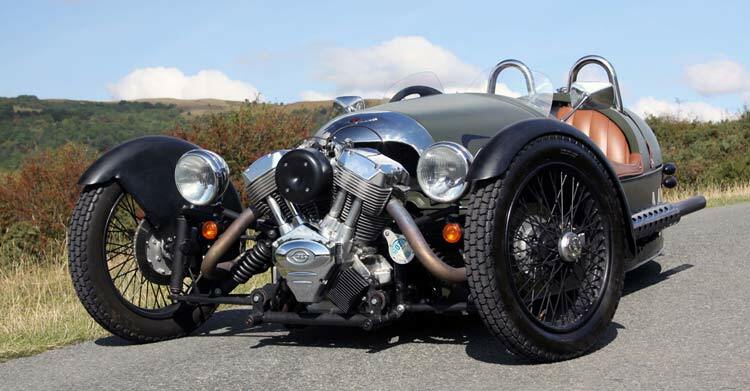 The Morgan Motor Company is definitely not your average car company in many ways. To start with all Morgan automobiles are assembled by hand in England. The Morgan Motor Company is located in Malvern Link, Worcestershire England and was originally formed in 1910 by Henry Frederick Stanley Morgan. The company typically builds between 600 and 700 cars per year by their employees which numbers less than 200. You won’t find Morgan car dealerships loaded with inventory because you will have to order it from the Morgan car brochures and wait for it to be built. The amount of time it would take to receive your Morgan car after you place an order may range anywhere form 6 months to a year. However they have had a backlog of orders in the past that took nearly ten years. The founder of the Morgan Car Company worked for the Great Western Railroad and purchased his first automobile in 1902. Then in 1904 Henry Frederick Stanley Morgan left the railroad and opened a service garage and motor sales business with a partner in Malvern Link. Henry decided to design and built his own automobile for himself in 1909 and ultimately started building cars for the public, which was ultimately successful. Henry continued to build cars until his passing in 1959 at age 77. Morgan car brochures were rare back in the day, but they did have some sales flyers, which we are currently trying to find. Henry’s son Peter Morgan took over the company and continued until his death in 2003. The Morgan Car Company continued to changed management, but continues to hand build fine automobiles. Today the parent company is Morgan Technologies which is public held and operates the Morgan Car Company, Aero Racing Limited and Morgan 3 Wheeler Limited. Check out the Morgan car brochures and sales literature to better appreciate the Morgan line of vehicles.